I’ve never been a huge fan of David Croft’s habit of putting his characters in silly costumes for comedy effect (he did it a lot in his work with Jeremy Lloyd) but there are occasions when it works well, and the episode Don’t Forget the Diver is one of them. In fact sartorial peculiarity quite a theme of the episode with Jones dressed as a tree, sheep with tin hats and Captain Square with a gold hunter watch in his mouth. 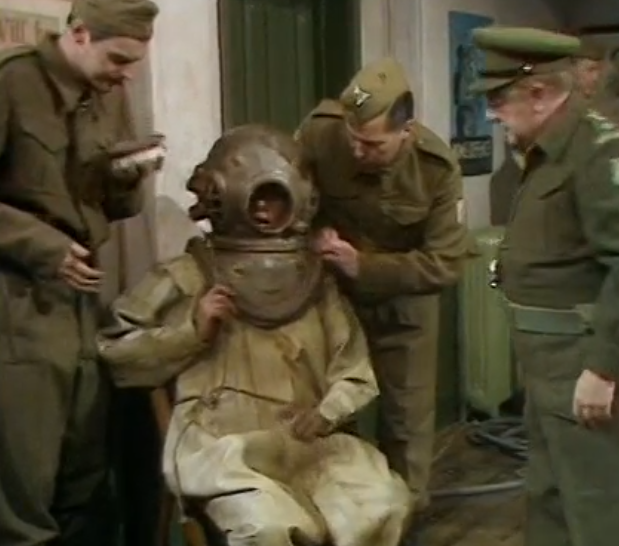 The the best of them is Frazer and his diving suit – seemingly a proper Victorian one with lead boots and a manual pump to keep the air flowing. And the story of how he came by it is just as exotic incorporating pearl-diving, a tragic death and a poor-old widowed mother. And, as so often with Frazer’s tall tales, the comic pay-off at the end is well worth waiting for. The episode was recorded exactly 48 years ago today on 24th July 1970. This entry was posted in blog on July 24, 2018 by wolAdmin.